Screen printing is a printing method that uses a screen to hold a stencil to receive an image. 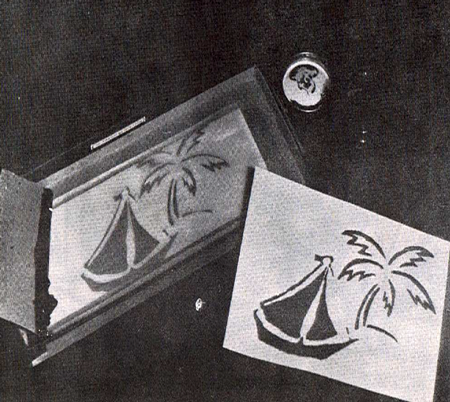 This stencil forms open areas of screen that then transfer paint (or ink) through the screen as sharp printed pictures. You use a squeegee (or similar tool) to push the ink (or paint) thru the screen. You can use screen printing techniques to create prints on t-shirts, posters, wood, plastic, and many other surfaces. Below you will find a basic screen printing project to try out and build upon. 1. 1. Large embroidery hoop, wooden frame or strong cardboard box lid with a "window" cut in it. 1. (a)Stretch the curtain material smoothly and tightly in the embroidery hoop. If the hoop is not tight enough, place masking tape inside the larger hoop. 1. (b)If a wooden or cardboard frame is used, stretch and staple or tape the curtain material across the opening of the frame. 2. Cut your stencil out of newsprint or other thin paper. The stencil should be the same size as the frame. 3. Lay the prepared frame or embroidery hoop face down on your work table so that the curtain material is down on the table surface. 4. Wet the curtain material with a sponge. 5. Lay your stencil on a flat surface, wet it, and place the screen down on top of it. Press the screen and stencil together with a wet sponge. 6. Place a piece of paper under the screen and stencil; place some finger paint on the edge of the screen inside the frame. 7. With the squeegee, pull the paint across the surface, squeezing the paint through the curtain material. NOTE: The first print will help the paper stencil to adhere to the material and subsequent prints should print faster and easier. 8. Overlap various designs for greater complexity. 9. Clean the wet paint out of the material by holding it under running water.